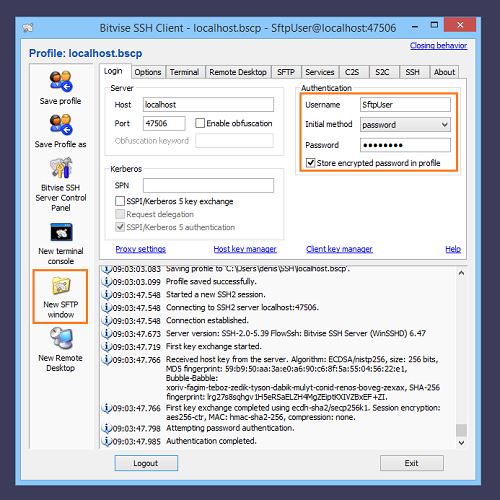 You have installed Bitvise SSH Client on the same computer as the server to aid with initial setup. 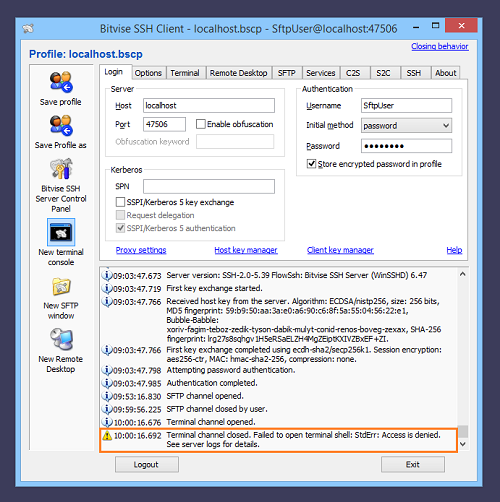 You would like to configure the SSH Server to provide file transfer access via SFTP and SCP. 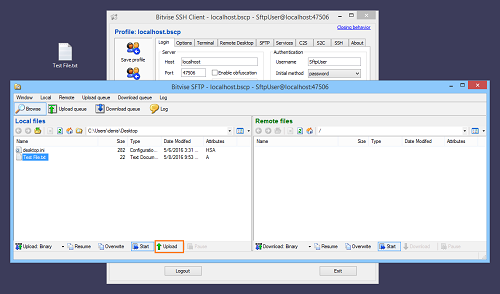 The SSH Server supports file transfer protocols SFTP and SCP. Both of these run over SSH. The SSH Server does not currently support plain FTP, or FTPS (FTP over TLS/SSL). We plan to support FTPS in a future version. 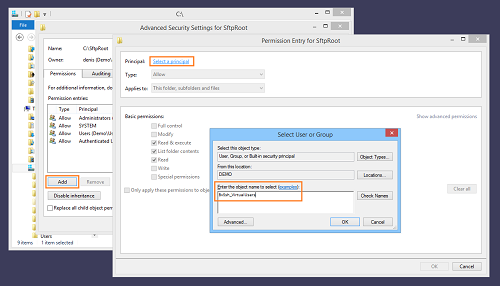 Do not allow shell access (or exec requests). 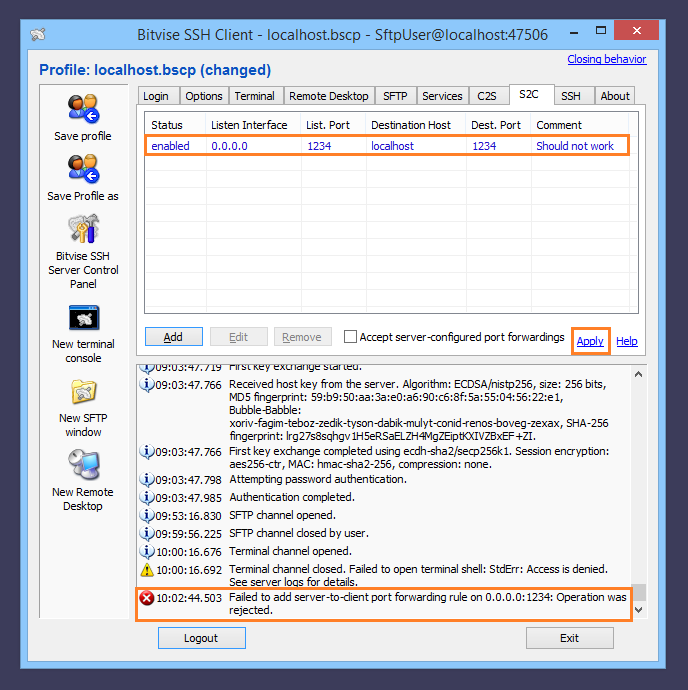 Do not allow port forwarding. The main settings to configure are the virtual account name, password, and the root directory for file transfers. 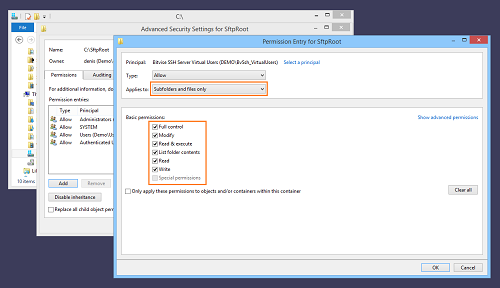 It is important that accounts which should have limited access to the server's filesystem are not granted a shell access type that provides Command Prompt, PowerShell, bash, or similar open-ended terminal shell access. When a user is given open-ended terminal shell access, this shell is a third-party application that does not know about the SSH Server's virtual filesystem, and does not respect settings such as Limit to root directory. 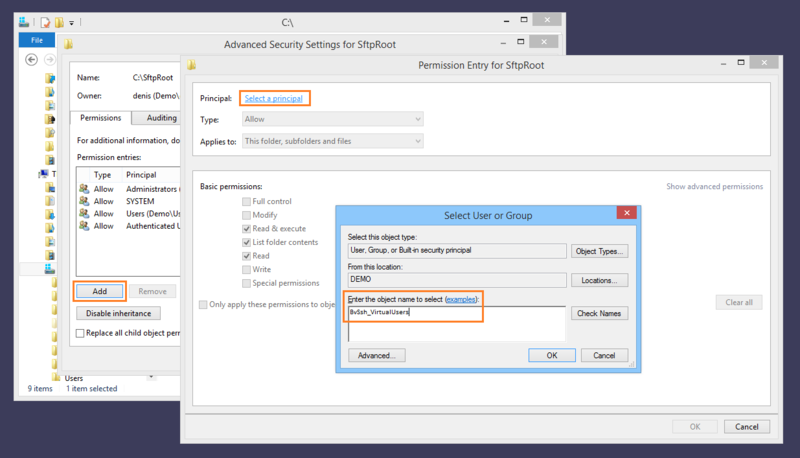 Users who are configured with Shell access type set to No shell access will not be able to connect using a terminal SSH client, such as PuTTY. 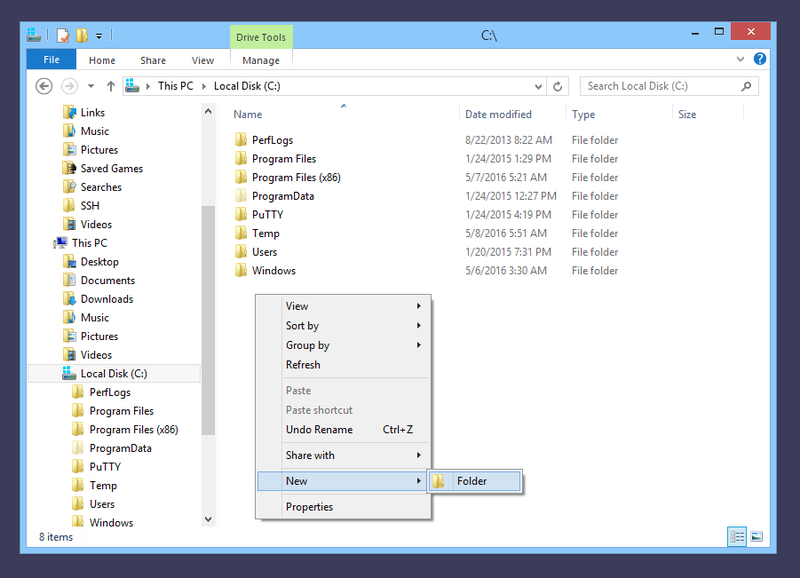 However, they will be able to connect with a file transfer client, or if the terminal client is instructed to not try opening a terminal shell. Create at last one virtual account. Start the SSH Server with at least one virtual account created. Therefore, to make sure the BvSsh_VirtualUsers account exists, start the SSH Server and stop it. 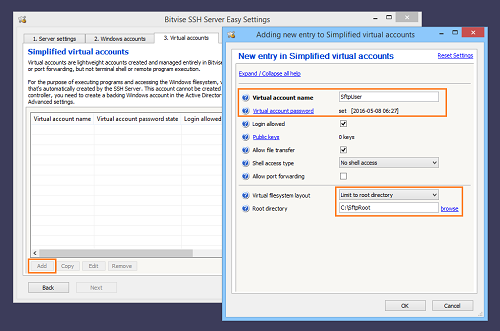 If you experience issues finding the BvSsh_VirtualUsers account, check Q440 and Q460 in the SSH Server Usage FAQ. The Windows account BvSsh_VirtualUsers is a member of the Users group, but this group does not have Windows filesystem permissions to write to C:\SftpRoot. We will need to add permissions to allow virtual accounts to upload. 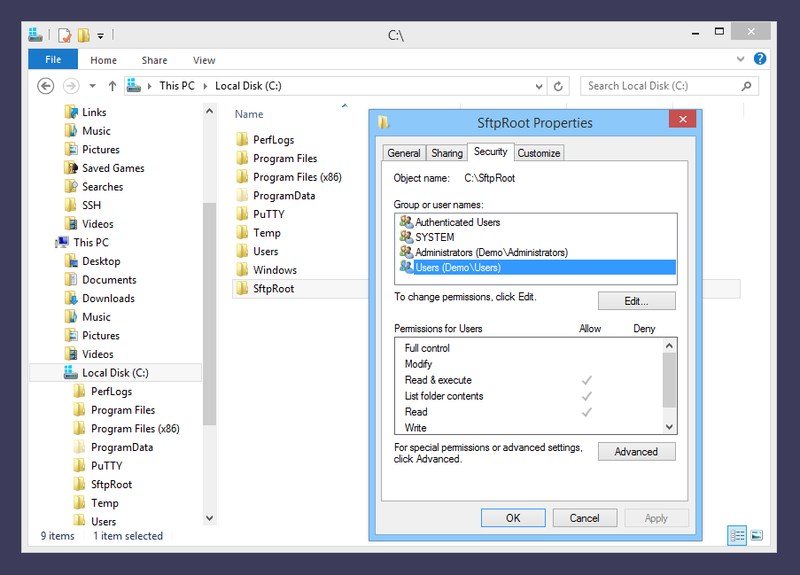 This will allow virtual accounts to have full control over the files and subfolders in the C:\SftpRoot directory; but not over the parent directory itself. It is possible to use this interface to grant more nuanced permissions also. 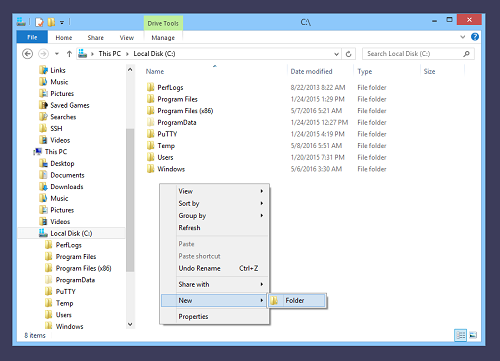 To control users' access to files and directories, you may use any combination of Windows filesystem permissions; mount point permissions configured in Advanced SSH Server settings; or both. 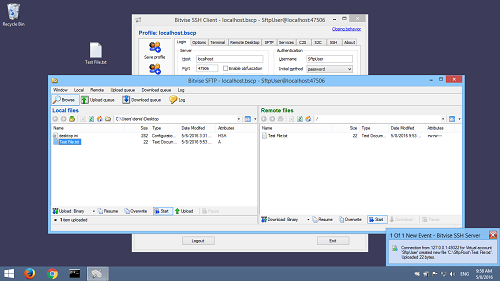 We use the same localhost SSH Client profile we created previously. We enter the new username and password and press Login. 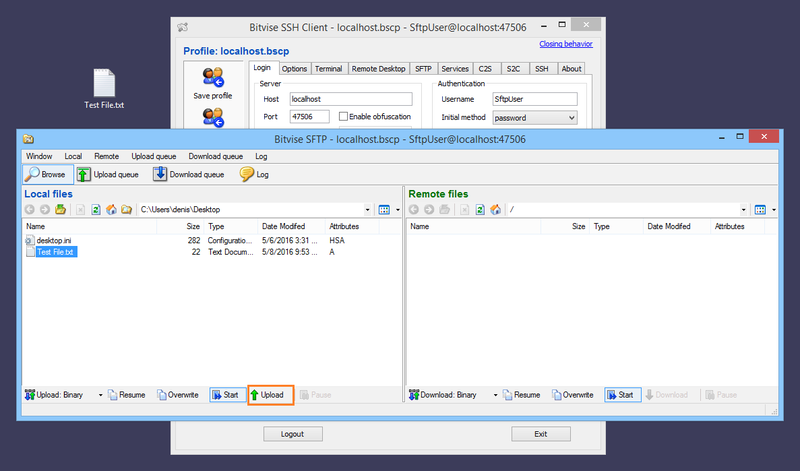 In this case, we have used the Options tab to disable automatic opening of the SFTP and terminal windows. Therefore, we click New SFTP window when the SSH Client connects. If everything has gone well so far, the SFTP window opens. 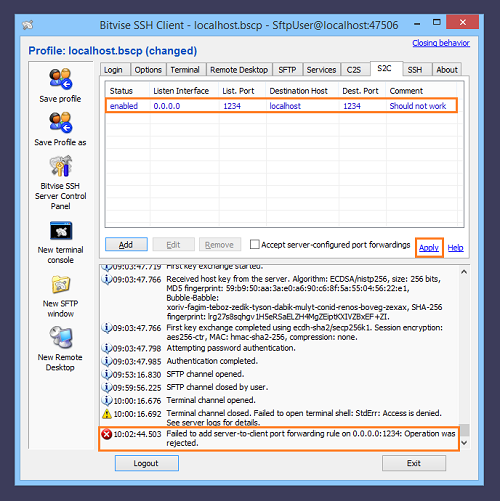 To perform the same check for client-to-server port forwarding (C2S), it is necessary not only to configure the rule, but also to try to connect.